All Hallow's Eve Is More Than Candy and Playtime For Some Members of Society. Halloween comes and goes for most of us. But for members of Wicca--one of the fastest growing religions in the world--the season of Samhain is a magic time. 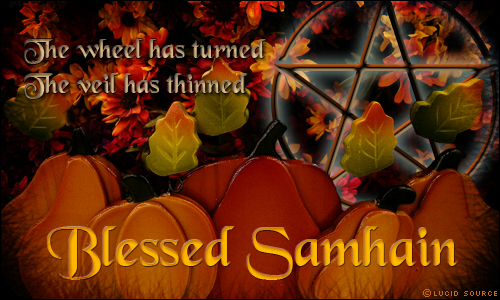 The Halloween Sabbat (celebration) concludes for Wiccans on November 1 with the final turn of the year-wheel. Mother Earth nods a sad farewell to the god who will be reborn at Yule (December 20), and the life cycle begins anew. This is a time to honor the Earth Mother, remember the Ancients, and revere the Horned god of the Hunt. * Yule is on December 20 and celebrates the goddess giving birth to the Sun god. * The next season is Imbolc and marks the recovery of the goddess after giving birth to the god. * The Spring Equinox (Ostara) marks the first day of Spring. The goddess awakes as the days grow longer and the light overtakes the darkness. The goddess fills the earth with fertility. * Beltane celebrates the transformation of the boy god into manhood. He is filled with lust for the goddess and lies with her in the grass. The earth becomes pregnant with her vitality. Crops begin to grow. Flowers bloom. * Litha (midsummer) arrives as the powers of nature escalate. The Earth Mother is filled with fertility. Wiccans practice numerous kinds of magic during this season. * The next season is Lughnasadh, the time of the first harvest. The Wiccan god begins to lose his strength as the Sun rises higher each day. The nights grow longer. The god begins to die. * Mabon is the completion of the harvest. The Wiccan god suffers death, draws back into darkness, and waits to be reborn at Yule. The Wicca year-cycle described above is similar to concepts held by early pagans who viewed the natural world with awe and superstition. Ancients watched the changing of the seasons and wondered about the life and death of crops. They perceived such natural processes as mystic, and developed fertility cults with gods and goddesses who died and were reborn. The worship of the earth's "spirit" as a mother, and the incarnation of the earth's fertility forces within dying gods and goddesses, developed into one of the most widespread forms of paganism in antiquity. Whether it was Inanna of the Sumerians, Ishtar of the Babylonians, or Fortuna of the Romans, every civilization had a sect of religion based on the embodiment of the earth's spirit as a caring mother-goddess. The Egyptians worshipped Hathor in this way, as did the Chinese, Shingmoo. The Germans worshipped Hertha as the great Mother Earth, and the apostate Jews idolized "the queen of heaven." In Greece, the queen of the Olympian goddesses and Mother Earth was Hera. Before her was Gaia (Gaea), the creator-mother earth, and beneath her were many other earth goddesses including Demeter, Artemis, Aphrodite, and Hecate. The principal idea was, and evidently still is among Wiccans, that the Earth is a sentient being. The ancient and universally accepted idea that the "living Earth" was also a fertile mother was conceptualized in different ways and in various goddess myths and images throughout the ancient world. In The Golden Asse, by second century Roman philosopher Lucius Apuleius, the spirit of the earth was perceived as a feminine force that could express itself at various times and to different people within the goddess mothers. O blessed Queene of Heaven, whether thou be the Dame Ceres [Demeter] which art the original and motherly source of all fruitful things in earth, who after the finding of thy daughter Proserpina [Persephone], through thy great joy which thou diddest presently conceive, madest barraine and unfruitful ground to be plowed and sowne, and now thou inhabitest in the land of Eleusie [Eleusis]; or whether thou be the celestiall Venus [or] horrible Proserpina, thou hast the power to stoppe and put away the invasion of the hags and ghoasts which appeare unto men, and to keep them downe in the closures [womb] of the earth; thou which nourishest all the fruits of the world by thy vigor and force; with whatsoever name is or fashion it is lawful to call upon thee, I pray thee, to end my great travaile. Behold Lucius I am come, thy weeping and prayers hath mooved me to succour thee. I am she that is the natural mother of all things, mistresse and governesse of all the elements, the initial progeny of worlds, chiefe of powers divine, Queene of heaven, the principall of the Gods celestiall, the light of the goddesses: at my will the planets of the ayre [air], the wholesome winds of the Seas, and the silence of hell be disposed; my name, my divinity is adored throughout all the world in divers manners, in variable customes and in many names, for the Phrygians call me the mother of the Gods: the Athenians, Minerva: the Cyprians, Venus: the Candians, Diana: the Sicilians, Proserpina: the Eleusians, Ceres: some Juno, other Bellona, other Hecate: and principally the aethiopians, Queene Isis. I will sing of well founded Earth, mother of all, eldest of all beings. She feeds all creatures that are in the world, all that go upon the goodly land, and all that are in the paths of the seas, and all that fly: all these are fed by her store. Through you, O queen, men are blessed in their children and blessed in their harvests, and to you it belongs to give means of life to mortal men and to take it away. Happy is the man whom you delight to honour! He hath all things abundantly: his fruitful land is laden with corn, his pastures are covered with cattle, and his house is filled with good things. Such men rule orderly in their cities of fair women: great riches and wealth follow them: their sons exult with ever-fresh delight, and their daughters in flower-laden bands play and skip merrily over the soft flowers of the field. Thus it is with those whom you honour O holy goddess, bountiful spirit. Hail, mother of the gods, wife of starry Heaven; freely bestow upon me for this my song substance that cheers the heart! And now I will remember you and another song also. From these and other ancient records, it is obvious that the earth was more than an agricultural or herbaceous facility to the pagans. She was the personable and "eldest of all beings," the "holy goddess," the "bountiful spirit," the all-nourishing mother of men who manifested herself within the popular idols and mother goddesses. Modern Wiccans and neo-pagans perceive the earth similarly, often referring to the earth as Gaia--a living, caring entity. We are told that people are just one of Mother Earth's species, not her dominators. She provides the living biosphere -- the region on, above, and below her surface where created things, both physical and spiritual, live. During the Samhain sabbot (Halloween), pagans celebrate the time when the veil between the living and the dead is at its thinnest, a period when those spirits beneath Gaia's surface can more easily communicate with the living. Wiccans might find it interesting that many Christian theologians agree with the idea that the physical earth contains spiritual forces. For instance, in the Book of Revelation, chapter nine and verse fourteen, we read of "the four angels which are bound in the great river Euphrates." Likewise, in Job 26:5, we find "Dead things are formed from under the waters." The literal Hebrew translation says, "The Rafa (fallen angels) are made to writhe from beneath the waters." Additional biblical references indicate that the earth is a kind of holding tank, or prison, where God has bound certain fallen entities. (2 Pet. 2:4; Jude 6) That such fallen spirits seek to communicate with, or participate in the affairs of humanity, is defined in Scripture. The Hebrew people were warned that earth spirits pretending to be gods might seek communion with men, and, when the witch of Endor communicated with the same, they ascended up from "out of the earth" (1 Sam. 28:13). It would seem therefore, based on such Scriptures, that the dynamic or energy behind the earth-goddess-spirits of Halloween is indeed real, and, according to Christian doctrine, identical with the legions of fallen spiritual forces bound within the earth. As in antiquity, those who practice modern paganism are guilty of worshipping "devils" (Rev. 9:20). The dogma once embraced and that continues through such earth-centric paganism as Wicca is defined in scriptures as the "doctrines of devils." The Apostle Paul said, "the things which the Gentiles sacrifice, they sacrifice to devils" (1 Cor. 10:20). In Acts 7:41-42 (Jerusalem Bible), it describes those who worship idols as joining themselves to the "army of heaven" [stratos, the "fallen angel army"], and Psalm 96:5 concludes, "all the gods of the nations are idols" (elilim, LXX daimonia [demons]). Thus, pagan images, such as those that represented the ancient gods and goddesses were "elilim" (empty, nothing, vanity), but behind the empty idols were the living dynamics of idolatry and spiritual objects of pagan adoration: demons. Because the Bible clearly defines such goddess worship as the homage of demons, and since demons are eternal personalities that desire the worship of humans, it is fair to characterize Wiccan deities, including the god, goddess, and Horned god of the Hunt, as neo-pagan titles attributed to demon spirits. "Apollo delivered his last oracle in the year 362 AD, to the physician of the Emperor Julian, the Byzantine ruler who tried to restore paganism after Christianity had become the official religion of the Byzantine Empire. 'Tell the King,' said the oracle, 'that the curiously built temple has fallen to the ground, that bright Apollo no longer has a roof over his head, or prophetic laurel, or babbling spring. Yes, even the murmuring water has dried up.'" The worship of Diana in Ephesus was another stronghold of earth-centered goddess cults. Dianic witchcraft was the greatest unifying religion among all pagan people up to that time. It took 220 years to build the massive temple to Diana in Ephesus. Yet when Paul preached the Gospel of Jesus to the Ephesians, "Many of them also which used curious arts brought their books together, and burned them before all men: and they counted the price of them, and found it fifty thousand pieces of silver. So mightily grew the word of God and prevailed" (Acts 19:17-20). May we with joy declare such a life-changing Gospel and not be ashamed "of the gospel of Christ: for it is the power of God unto salvation to every one that believeth; to the Jew first, and also to the Greek" (Rom. 1:16).